I loved the characters in this feels inducing anime. The development is heartfelt and shows a lot of dynamic sides to them. The drama is definitely there and the comedy matches it well. I was left feeling like it was a tad bit incomplete and I am hoping that this will give them an opportunity to do a second series of this. Worth the watch and the roller coaster! 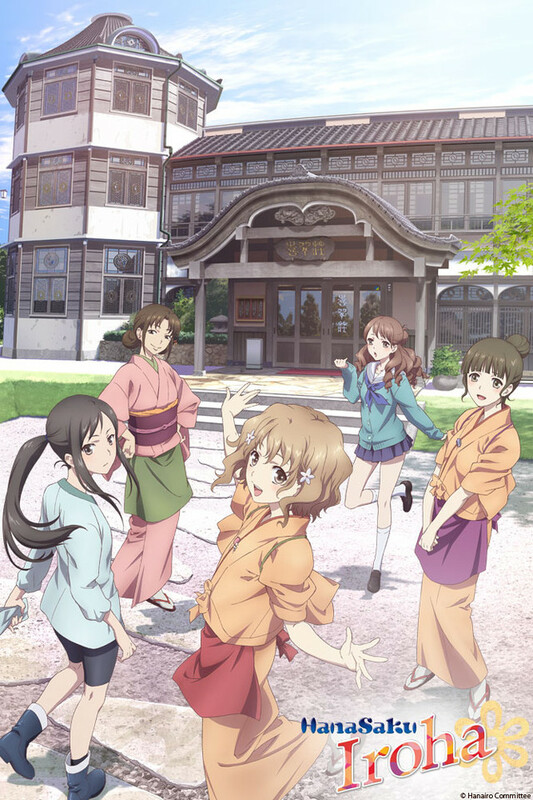 Hanasaku Iroha is an absolutely beautiful hidden gem that has many genres of anime inside. It is light on the romance aspect and focuses primarily on creating romantic tension which is a difficult balance that it pulls off well. It is a very real anime in respect to the challenges Ohana faces in her life. From her absentee mother to her questionable relationship status with her fling Ko, it all ties in together wonderfully. One thing that I noticed specifically is that this anime manages to create deep and meaningful characters that you cannot but help get personally involved with. Each character has their own ambitions, their own struggles, and their own desires. There is conflict that feels meaningful and there are tears that dont feel overexaggerated. All the emotion that is presented feels real and that is what this anime does to truly shine. It is a bit slow going and if you are looking for something more romance based this isn't your show, It is present but doesn't take the forefront as it's not the basis of the story. Overall I would watch this again, its a wonderful take on real life situations that occur and it does a wonderful job at portraying real emotion. #66. When down, fest it up! Ohana Matsumae is an energetic and wild teenager residing in Tokyo with her carefree single mother, until her mom decides to run away with her new boyfriend to escape tax collectors. Ohana is then shipped off to her grandmother’s, where she ends up working at a small inn; left to raise herself and figure out where she truly belongs in the world. I would describe Hanasaku Iroha as having a very real story along with a great cast of strong characters. It's one of my favorite slice of life comedies of all time, and I absolutely adore Ohana's character, her struggles and emotions touch me, and it is the only anime or show in general I can think of that made me cry on it's first episode. If that isn't enough of a glowing review, well too bad, I ain't saying anymore, watch it! It's hard to pick them all out or even give just a few without spoiling such a beautiful anime. Truly fantastic, keeping your attention time and time again through every episode. +Everything you want and more from a perfect slice of life. I would recommend this anime to anyone and everyone. This series is nice. I loved the cast of characters, and the score was beautiful. The animation was beautiful and great care was taken for accurate portrayals. However, the story I felt floundered a bit. It started off well, making you feel for the lead Ohana before the end of the first episode. The first half of the series did an excellent job continuing off that and building momentum. But I found that after they returned to Tokyo, the story began to falter. I never truly felt the chemistry between Ohana and Ko. I could see he cared a bit, but I never got the same vibe from Ohana. It felt less like actual romantic affection and more "Well, I miss you a lot, so that must be love, right?" The kind of idea a young kid has of love, but isn't actually love. So after the Tokyo visit and this romance came more into the forefront again, I found my interest waning and my irritation waxing. Maybe others buy this romance, but I couldn't which lead to the latter half getting progressively worse storywise. A slice-of-life drama with some story arc. High school girl is “abandoned” by her immature mother into the hands of her strict grandmother and put to work in the grandmother’s inn. There she meets other workers, some of which are also school mates, and begins the process of self-discovery and growing up. (“Festing it up!” as she begins to say.) She comes to understand and appreciate her mother’s life choices, the lives and individuality of her co-workers and grandmother, and the caring expressed by her boyfriend. I highly recommend this anime to whoever enjoys a good slice of life with good character development. It was quite slow but still enjoyable because you are able to understand the characters more. The main character Ohana was enjoyable to watch and surprisingly enjoyed her character and her relationship with those around her. Beautiful animation as expected with PA works. This story seems like a perspective of one girl but it really is about how a place and the people in it can have a huge affect on your life and goals including how goals change over time. Beautiful, heartfelt, well animated and worth rewatching again. I watched this show on a whim. Having never heard of it before, the story seemed cute enough. Cute doesn't even begin to describe it. I was so quickly drawn to the MC's charm, Ohana, a vivacious high school age girl who is sent off to work at her Grandmother's very traditional Inn. As the story unfolded, I was so taken with each character and their devotion to the place where they work. Not only is the Inn where they work, but it truly is where their lives unfold, and it's delightful. I was moved by this show and enjoyed it from start to finish. The best slice of life anime I've seen!! HanaSaku Iroha is amazing and I would highly recommend it to anyone that wants a really good slice of life anime to watch. To start off, the animations themselves are great. The plot/premiss is good and somewhat relatable. Everyone has struggles with friends at some point in their life and this anime does a great job of conveying that. Even though things might be hard some times Ohana always strives to do her best and "sparkle". I really wish this anime had more episodes because it was very entertaining! I'm giving HanaSaku Iroha 5 stars because I think it deserves a lot more credit for what its worth, definitely a gem in the slice of life genre.